The last open band night on December 20, 2018 was so awesome that we wanted to schedule the next one soon. The open band is everyone’s opportunity to play music for live contra dancers on stage. It’s the warmest, fuzziest thing we’ve ever done. In an open band, everyone is welcome! The goal is simply to have fun together playing music for dancers. There is room for new, intermediate, and experienced musicians alike. Fearless Leader, Emily Troll, makes the group work for everybody. Invite folks who play instruments that you don’t normally see at contra dances. Invite folks who haven’t been to a contra dance before. Fearless Leader, Emily Troll, along with the lead rhythm player, Neil Pearlman, and lead melody player, Clara Stickney, will host a practice party about a week or so ahead of the dance. Attending this party is not required for participating in the open band on April 25, but it is recommended. To find out about the date and location of the practice party, email Emily at etroll@wesleyan.edu. PICD Winter Ball 12/20/18. Music by the Pic'd Up Orchestra (Emily Troll conducting, Clara Stickney lead fiddle, Neil Pearlman lead piano, and 28 volunteer musicians). Calling by Dugan Murphy. Go Ice Skating With Us! Our dance floor is being refinished on Thursday, February 21, 2019, so let’s go ice skating instead! Meet us at The Rink at Thompson’s Point (10 Thompsons Point) in Portland. Admission is $8 for ages 6 and up ($5 for ages 5 and below), plus $3 if you got to rent skates. Drop in anytime between 7:00 and 9:00PM. The rink closes at 9. Your Help Needed to Keep Joy Emanating! To dance is to live. To donate is to make dance possible. Tax-deductible donations from loving folks like you make our dance community the best thing ever. We'd love to send you a letter (for your tax records) thanking you for your generosity. Everyone likes getting mail! You can also mail a check made out to "Portland Intown Contra Dance" to PO Box 784, Portland, ME 04104. This heartfelt request comes from the PICD Board of Directors. Can't wait for another year of revelry and connection. Have you heard of or seen the open band at Portland Intown Contra Dance? Have you thought maybe that you’d like to play your instrument for dancers, but weren’t sure how to get a place on the stage? Here’s your chance to get involved. The goal is simply to have fun playing together for dancers. If you’ve been playing fiddle for two days, come and saw away on your D string. If you’re a more experienced player, come share your music with the community. A good time is guaranteed for all. A great open band has a diverse array of instruments. Fearless Leader, Emily Troll, would especially love to recruit some trombone and trumpet players, so please spread the word, even to your friends who don’t dance yet. Think outside the box. And for those folks wanting a little preparation, we will have a practice party to get ready on December 8, 10AM-12PM. So are you in? If so, please email Emily at etroll@wesleyan.edu for more information about the location of the rehearsal and about joining the band. On Thursday, June 14, PICD will celebrate the two-year (two years already!) anniversary of our growing, vibrant dance community with the second open band night. We are also taking the opportunity to switch the role terms we use from "jets" and "rubies" to "larks" and "ravens." Larks (replacing jets) start the dance on the left of their partner; ravens (replacing rubies) start on the right. What's up with these new terms, you ask? Larks = Left and Ravens = Right makes a lot of sense, especially if you're learning. A lot of people say that "jets" and "rubies" have masculine and feminine connotations that incorrectly imply that the two roles are attached to gender. "Larks" and "ravens" have less connection to gender. Over the last two years, pretty much all the contra dance communities around the country that use gender-free roles have switched to using these words, so now we're aligned with them. Anyway, it's just dancing. See you soon! Free dances for regulars and walk-ups. Have you ever walked down the street and wondered what it would be like to share the joy of contra dancing with the folks walking next to you? When we dance outside downtown, people stop and notice. Then we ask them to dance! Thanks to a collaboration with Friends of Congress Square Park, PICD will be offering free outdoor dances on third Wednesdays June through September 2018! All dancing will be from 6 'til 8 PM in Congress Square Park, located on the corner of Congress and High Streets downtown. Wild Rumpus (Deborah Colón, Karl Colón, and Bobby Douglas) from Ohio will be performing, joined by caller Darlene Underwood, also from Ohio. They'll also be performing for us for our regular Thursday-night contra dance on June 21. Local favorite, Dugan Murphy, will be calling with music by The Riff Raff. They are Jesse Ball (accordion), Everest Witman (guitar), Matt Kenney (drums), and Clara Stickney (fiddle). Here they are (with Julie Metcalf on fiddle) caught on video being awesome. Dugan Murphy is calling again, this time with Maivish, playing tunes from the British Isles, Ireland and America with a mix of original compositions. With Jaige Trudel on fiddle and Adam Broome on guitar, their performances are infused with lush vocal harmonies, inspired interplay, and captivating spirit. Rising star, Shari Shakti, recently exploded onto the Maine-New Hampshire calling circuit and is quick becoming a regional standard on the mic. She is joined by Julie Vallimont from Boston (piano, accordion) and local favorites Emily Troll (fiddle, accordion), and Glen Loper (mandolin, banjo, percussion). See you in the park! We the organizers of Portland Intown Contra Dance have been doing a great job paying the bills and performers and raising money for needed costs when they arise (remember raising over $4,000 to purchase a sound system or when we raised $200 for an extra air circulator? ), but that always leaves us with little money in the bank for a rainy day. Nobody would want our dance to go away just because of a few slow evenings, right? Oh, and since it is a fundraiser, we figure we should have a 50/50 raffle. How about that! Bring a few extra bucks to play the 50/50 raffle! See the event page for more details, invite your friends on Facebook, and download the flyer to share the news! We had a such a good experience hosting a fundraiser dinner at B.Good back in November of 2017 that we decided to have another in April of 2018. 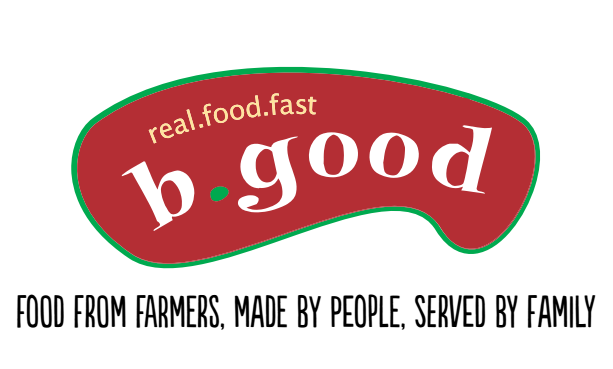 We will be gathering at downtown Portland's B.Good restaurant on Exchange Street in the Old Port the evening of Wednesday, April 25, 2018 and enjoy some good food while raising money for PICD! A portion of all proceeds from food, beverage, and beer sold that evening will go to our dance, for orders between the hours of 6 and 9PM.